On 13 May iSpot passed the half-million mark! 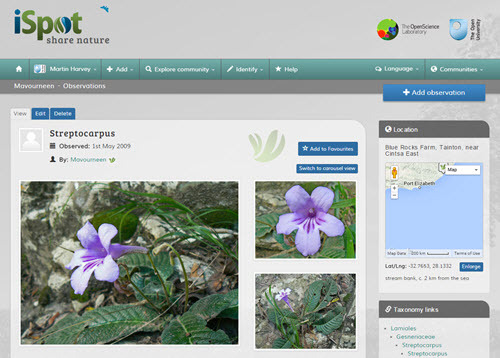 Over 500,000 wildlife observations have now been added to iSpot, an amazing celebration of the diversity of life and of the enthusiasm of iSpotters all round the world in finding species and helping each other identify them. Exactly which observation forms no. 500,000 does depend a little on how you count them, but our best estimate is that the half-millionth observation was of a Cape Primrose (Streptocarpus primulifolius), added by iSpotter "Mavourneen" from the coast of South Africa. Honourable mentions also to nos. 499,999 (a combination of two Scottish plants) and 500,001 (Azure Damselfly from Woodwalton Fen, England)! Thanks to all iSpotters for taking part and helping identify so much wildlife! With over 50,000 registered users and almost a million photographs associated with those half-million observations you continue to make iSpot a showcase for biodiversity around the globe.